Pass through the veil of twilight to visit the fantastic world of ARIA, a world where fairy princesses and creatures of ancient myth walk unnoticed through the streets of our modern world. Featuring four magical, unforgettable tales, woven together into a single, magnificent tapestry, this special stand-alone edition provides glimpses into the secret lives of Lady Kildare, Pug, Ondine and others as youve never seen them before. This collection is an ideal primer for readers new to the series, and a welcome addition for long-time fans. 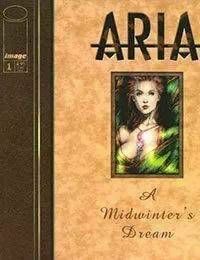 A mix of story and art, prose and pictures, ARIA: A Midwinters Dream features ALL NEW art by superstar illustrator JAY ANACLETO. Not to be missed.